A group study room is available to registered students who wish to work together on projects and assignments and is located on the ground floor in 200 Pearse Street (accessed between the Samuel Beckett Theatre & the College Health Centre). Please see 'Getting Started' section below for available times and dates. You will need your Trinity ID to book the room and you can 'swipe' into the room with your Trinity ID card. 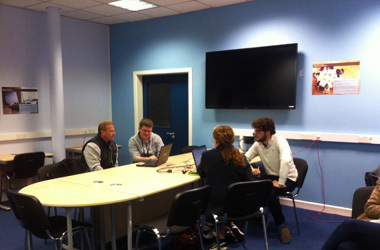 Students working as part of a group can book the room for a maximum of two sessions per week. This is to allow a range of student groups to get an opportunity to book the group study room each week. The bookings for this resource room will be monitored by IT Services. Groups must consist of at least three students or more, up to a maximum of 12 students in one booking. Students are free to use the Group Study Room as suits their needs but we ask that the room is left clean and tidy for the next group of students who have booked the facility. The student who makes the booking is ultimately responsible for ensuring that no damage is caused to any furniture or equipment in the room. IT Services will not be responsible for any loss or damage of goods or property left on these premises by any student.